Many people rely and trust our original Eczema and Psoriasis Cream and so we would not want to stop making it for them. We would surely be in a lot of trouble if we changed it. However, we have kept researching how to further improve our formulas. We have included extra ingredients in this cream such as Raw Coconut Oil, Bisabolol and Elderberry Extract. Our original cream has been very popular for many years and this is designed as a boosted version. We are finding that both version are popular. This balm can be followed by the MSM Soothing Cream moisturiser which is designed to keep easily irritated skin moist and supple. Directions: Apply cream topically as required to keep skin moist and healthy. ALWAYS READ THE LABEL. USE ONLY AS DIRECTED. IF SYMPTOMS PERSIST SEE YOUR HEALTHCARE PROFESSIONAL. WE RECCOMEND PATCH TESTING THIS PRODUCT. 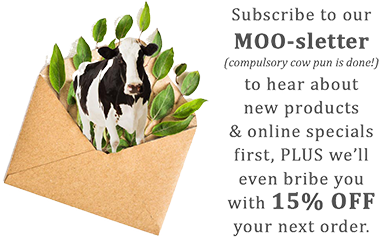 MooGoo is proud to show all the ingredients on our website, not only the actives or herbally sounding ones. Active Ingredients: Althaea officinalis root ext.conc. eqv dry 100 mg/g, Coconut Oil 50 mg/g, Sambucus nigra fruit juice conc., eqv juice fresh 35 mg/g, Calendula officinalis flower Ext liquid Eqv.Dry 10 mg/g, Centella asiatica herb Ext liq. eqv. dry 5 mg/g. Excipient Ingredients: Water - purified, Wax - emulsifying, Almond Oil, Olive Oil, Squalane, Aloe vera juice conc., d-alpha-Tocopheryl acetate, Piroctone olamine, Allantoin, Bisabolol, Humulus lupulus flower Extract liq conc. Marshamallow Root Extract. (Althaea officinalis) No we aren't putting fluffy treats into our new Eczema Balm. Marshmallow is an African plant that has been used medicinally for around 2000 years. Marshmallow extract contains flavanoids for soothing the skin.The extracts could also help remove dead skin tissue. Elderberry Extract (Sambucus nigra extract) "Elderberry Salves" and ointments have again been used for centuries as a home remedy for Eczema, particularly in Europe. Like many home remedies (but not all), scientists have since narrowed down why Elderberry extract is so effective. The tannins and viburnic acid in elderberries provide its soothing properties. Raw Coconut Oil Raw Coconut Oil is definitely not something we discovered as a way of helping soothe eczema. It is good, but on its own a bit greasy and uncomfortable. In a cream it is perfect. It is the Medium Chain Fatty Acids that give Raw Coconut Oil its soothing properties. Calendula Flower Extract We believe a cream needs more than just Calendula. So we use a special concentrated extract of Calndula Flower in combination with all the other soothing actives. Centella Asiatica Extract Centella Asiatica has been used traditionally for skin conditions and is an essential part of our original eczema cream. Aloe Vera Juice Concentrate In order to get all the benefits of Aloe when there is only so much room in our cream, we have use a very concentrated form of the juice after the water is extracted. Bisabolol (German Chamomile Essential Oil) We love German Chamomile We are using Bisabolol which is the concentrated form of German Chamomile. A bit more expensive, but worth it. A very moistursing natural oil with a high fatty acid content. Olive Oil Another very moisturising oil. It would be "too much" by itself, but as part of an emulsion it gives a boost to its moisturusing abaility. Olive Squalane One of our favourite moisturising oils that is similar to human sebum. Water and Emulsifying Wax If we used only oils and actives, the cream would feel hot on the skin as the oils coat the skin and it becomes an occlusive. By making this cream with water, the cream penetrates the skin better, is more moisturising, and also feels more soothing and cooling. Natural Vitamin E (D-Alpha-Tocopherol) We use natural Vitamin E in our cream. This helps to hydrate the skin as well as keeping the cream from going rancid. Piroctone Olamine It is very important creams for broken skin are properly preserved and this is used for that purpose. Hops Extract (Humulus Lupulus Extract) This is one of our innovations. Hops Flowers are what was traditionally used to hep preserve beer. (Note: Hops are not alcoholic. They are used to make beer, but they are not fermented in our creams but the fresh extract). There are lots more reviews about our creams here. Some are below. I just wanted to drop you a quick but heartfelt thank you for your wonderful product Moogoo Eczema and Psoriasis Balm. I have always been blessed with good skin but the last 4 years I have suffered terribly all around my eyes. Last weekend I got up in the middle of the night and went driving for a 24 hour chemist. I found one but they didn't stock the cream that I had been researching to try next. They did, however stock Moogoo. No stinging! And it was so light that after a minute you couldn't even feel you had applied cream. My skin has returned to baby's bottom smoothness. My only disappointment was that I didn't take before and after photos to prove it. I've been singing your product's praises to everyone I know and searching your website for my next purchase. Maybe the Full Cream I think. Love your work! Just wanted to let you know that I have had a real problem with eczema for about 10 years. About 3 months ago I asked a store to recommend an every day moisturiser that simply wouldn't exacerbate the problem and they put me onto your eczema balm and your every day moisturiser. My skin responded almost and I have had no recurrence since regularly using your products. This is very exciting! Hello Moogoo. Thank you so much for the recent order you sent me. My son has suffered from eczema since he was 6 months old and at nearly 4 has never slept a full night due to all the itching. It has caused a lot of in our house as he is the youngest of three and needs a lot of attention. Your company was recommended to us by family who live in Melbourne and boy am I glad they did. What results we had in just . Jake actually slept last night for the first time!!!!!! His skin is comfortable and he loves the eczema balm which you sent to me as a sample, I have just ordered lots and lots of it. Once again thankyou, thankyou. Thankyou for your message and yes you have answered my email and sent samples which I received gratefully and so have many of my patients. The chemist next door to our practice has now stocked the products and all of my patients are buying them and all have never felt better. I have a 16 year old girl who had eczema and for all her life her mother has tried one product after another,. She is glowing and happy and her mother could not thank me and hug me enough- tears and many tears have been shed in happiness. So I send the hugs to you. This is only one story of many happy patients and the chemist is having to make bigger orders to keep up with the demand. You always take a bit of a punt when you order stuff online. You wonder if the product will come, if it will be in good condition and finally if it does really work. I took my chances and I can proudly say the Eczema and Psoriasis cream is an awesome product. My skin is healing really quickly. Everything about your company just makes sense. Where do we start. Most Importantly your products work, you delivered on time, you gave me a small bonus of MSM Cream with a smile drawn on the invoice (everyone loves bonuses), you label your ingredients clearly (active, excipient and preservative) and have a memorable funky company name. You guys just keep getting tick swooshes in the right places. I truly respect how your company is doing the best thing for its customers. You are a great Australian Company, keep it up. I'm so sorry for only getting back to you now. I just wanted to let you know that we have had great success using the moogoo products on my childrens eczema! HI Everyone at Moo Goo. I can’t recall ever writing to a company before but this is important. My daughter (aged 22) has been using Moo Goo for several weeks after a recommendation from a friend. I have seen such an outstanding change in her skin that I tried it too. I loved it of course. Yesterday we received our second order (the first coming from local health food shop and this one from your on-line store). (The on-line order worked very well by the way). In this order I received a sample pot of your MSM Soothing cream. If I could jump down this computer and kiss you I would. At 46 I believed that I would be forever with red itchy and break out skin. My whole life has been spent trying every product on the market. At 8.30 I unpacked our order. At 9.30 I cleansed my red spotty itchy face with my new oil cleanser, applied the soothing cream, applied my Double Cream and went to bed. This morning I woke to a face I have not seen since I was a child. The red is gone, all gone. The spots are smaller, much smaller (almost gone), and no itch. . My skin has a real creamy complexion and is soft to touch. This morning in my staff meeting at work 3 of my colleagues came to me, individually, and asked if I had been and had a treatment, and how long will it last. I intend to go to work tomorrow make up free. Many Many thanks. I have loved your Double Cream from the first application of the first container but your soothing cream is amazing. Read more about what customers have said about this product and our other products click here.